Filled with a striking purple filling, this blackberry meringue pie recipe is an eye catching and tasty take on the classic lemon version. Check out that colour contrast between the plum of the blackberry filling and the snow white of the meringue, doesn’t it catch the eye! Having recently been asked by British Lion Eggs to come up with an egg recipe, I was interested to learn a little more about the humble egg. They truly are a marvel, not only being adaptable enough to enable cooks and bakers to prepare both savoury and sweet dishes, but they’re pretty comprehensive too as far as egg nutrition is concerned! Although our household goes through almost a dozen eggs each week, mainly as an important support to Mr E’s vegetarian diet, I quickly surveyed family to learn what their favourite egg dish was. Many listed omelette, which of course is straight forward to make and can be pimped up to make a frittata. Egg mayonnaise sandwiches were also mentioned as were dippy eggs, which just have to be served with soldiers if you ask me! During a conversation with my mum, she mentioned that she seriously (and, yes, there was an awful lot of emphasis on the word ‘seriously‘) liked fried egg butties! She elaborated and said it had to be on a soft white tea-cake (bread roll) with a runny yolk. She could even remember the old lady who had introduced them to her whilst she worked in a bakery after leaving school! Mum used to make them for my brother and I periodically, and oh yes they were good! Simple, straightforward, fast yet nutritious food! Fast food doesn’t get better than this, with no microwaves anywhere near, nor any manufacturer’s packaging, other than the egg shell of course! But for me, being a lover of desserts and all things sweet, meringue jumped straight into my mind. Meringue pies are a great bake, because although the yolk and white are separated, the whole egg is used and you’re not left wondering what to do with that random egg yolk! 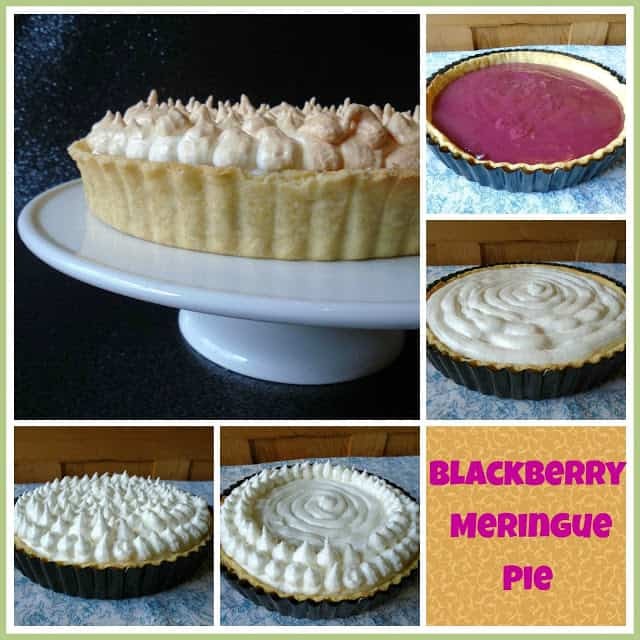 Although I love lemon meringue pie, I decided to ring the changes a little and use up some of the foraged blackberries I had lurking in the freezer. Not only does it add a beautiful colour to the filling, giving it arguably more presence to the table, the blackberries carry a slight tartness which works well when teamed with the sweet meringue. It was really delicious and neighbours who sampled it commented how much they had enjoyed it! In this bake I challenged myself to achieve a better edge to my pastry crust. As we all know, pastry needs to be refrigerated before rolling and baking to prevent, in theory, any shrinkage. Although I thoroughly chill the pastry, I still find it has a tendency to shrink back, probably because I trim the pastry before the blind bake, a habit I’ve always done since being taught how to make pastry with my mum and grandma. And to be honest, it is the easiest way. I decided to trim the pastry part way through the blind bake (just after removing the baking beans). I realise the ‘pro’ chefs trim their pastry cases after it’s been fully blind baked, but, call me chicken, I could just envisage the pastry cracking as I tackled it had I left it that long. As I wanted my pastry case to remain in one piece I took my time trimming it. I was successful! Yay! The pastry didn’t break and the shrinkage was by far reduced, certainly a technique I’ll apply to future bakes. Time: 30 minutes hands on; 45 – 50 minutes bake time; plus chilling and cooling time. 1. Prepare the blackberries. Tip the berries into a small heavy based pan with sufficient water to cover the base by 1cm. Place the pan onto a medium heat and allow them to cook down for 5 – 10 minutes, stirring periodically. Take off the heat and allow to cool for a couple of minutes. Break the berries down further by blitzing them with a stick blender or potato masher. Pour the blackberry mixture into a sieve suspended over a bowl. Use a spoon to encourage the mixture through the sieve into the bowl. Set aside to cool and discard the blackberry seeds remaining in the sieve. 2. Meanwhile, make the pastry. Have a look at my Guide to making pastry if you need a few further tips. Place the flour and cubed chilled butter into a good sized bowl. Rub the butter into the flour between your thumb and finger tips, until the mixture resembles breadcrumbs. Make a well in the centre of the breadcrumbs and add the 2 egg yolks. Using a rounded pallet knife, or similar, cut through the mixture to make a dough. You may need to add a little cold water to fully bring the mixture together. Tip the dough onto a lightly floured work surface and gently knead for 10 seconds. Shape the pastry into a ball and flatten into a disc. Wrap in cling film and place into the fridge for 30 minutes to chill. 3. Line the flan tin. Remove the pastry from the fridge and place onto a lightly floured work surface. Roll the pastry out until it is nice and thin, about 2mm. Wrap the pastry around the rolling pin, lift it up (using the pin) and place into the flan tin. Gently tease the pastry into the case so that it sits into the edges well and picks up the shape of the fluted sides. If the pastry tears, patch it with surplus pastry. If the pastry over hangs the sides of the flan tin excessively, use a pair of clean scissors to trim off some of the excess. Use a fork to gently prick the pastry base. Place into the fridge to chill for a further 20 – 30 minutes. 4. Pre-heat the oven to 210c / 190 Fan / Gas 6. Place a baking tray which is large enough to house the flan tin on the middle shelf of the oven. 5. Meanwhile complete the blackberry filling. Place the corn flour into a small heavy based pan and make a smooth paste with a little of the measured water. Gradually add the remaining water, continue to stir the mixture ensuring it is smooth and lump free. Add the blackberry coulis and mix again. Place on the hob over a low to medium heat and stir continuously with a wooden spoon until it thickens further. Continue stirring and cooking for a further 2 – 3 minutes. Remove the pan from the heat. Stir together the sugar and 2 egg yolks. Add the egg and sugar mixture to the pan containing the blackberry mixture and stir. Place back onto the hob and cook gently for a further 2 – 3 minutes, continuing to stir. Set aside to cool. 6. Blind bake the pastry. If you’d rather trim the pastry when it’s raw, use a sharp knife and trim the excess pastry now. Cut a sheet of grease proof paper large enough to cover the flan tin. Scrunch it up and open it out. Gently lay it on top of the pastry, easing it into the edges. Weigh the paper down with baking beans or uncooked rice / beans. Place into the oven (on the heated baking tray) and cook for 10 minutes. After 10 minutes, remove the baking beans and grease proof paper. If the pastry hasn’t been trimmed yet use a sharp knife to very carefully trim off the excess pastry. Return the flan tin to the oven and bake for a further 8 minutes. Remove from the oven and allow to cool. 8. Make the meringue. Using a scrupulously clean bowl and beaters (or balloon whisk), beat the egg whites. Once they have increased in volume and are at the stiff peak stage, add the sugar 1 teaspoon at a time. Continue to beat the meringue until all of the sugar has been incorporated. The meringue will now be glossy. 9. Start to assemble the pie. Spoon the blackberry mixture into the pie case and level it off with the back of a teaspoon. 10. Top with meringue. Either spoon the meringue onto the blackberry filling gently, spreading it out so that none of the filling is showing. Use the blade of a knife to create peaks in the meringue. OR, three-quarter fill a piping bag fitted with a star nozzle with the meringue. Pipe the meringue onto the blackberry filling in a smooth circle so that all of the filling is covered. Now pipe rosettes (or similar) on to the meringue base. 11. Bake. Carefully transfer the flan tin to the oven and place onto the heated baking tray. Bake for 25 – 30 minutes. You may need to rotate the tray after about 15 minutes. 12. Cool. Once the meringue is a beautiful golden colour, remove it from the oven and set onto a cooling rack to cool completely. * Disclaimer: This is a sponsored post, written in collaboration with British Lion Eggs. All opinions, written content and images are my own. Love Seasonal Food, hosted by Clare at Grubby Little Faces who is showcasing the beautiful blackberry this month. I totally agree with your Mum I love fried egg sandwiches, although not so much to awkward moment when the runny yolk drips down my chin! 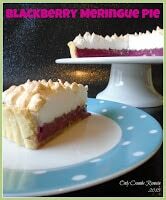 I love the sound of this pie, a lovely twist on the traditional lemon meringue pie. Thank you, the blackberry flavour came through really nicely. Your pie looks amazing totally drooling! 😀 I've pinned & shared – thanks for stopping by #TryaBiteTuesday and sharing your amazing recipe! Hope to see you back next week. I love the color of the filling in this pie! Absolutely beautiful. I think it looks professional enough to be on display. Thank you for sharing your recipe with #foodpornthursdays. Aw you're so kind Trista. It's an amazing colour isn't it. What an absolutely gorgeous pie! The color of the blackberry filling is stunning. 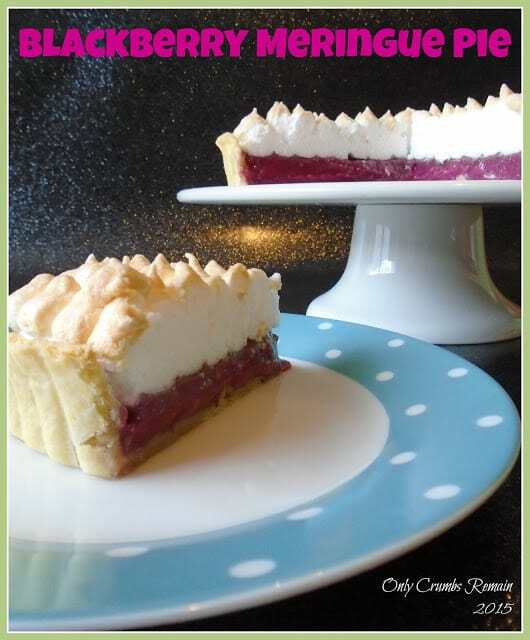 I've never seen a meringue pie with a fruit other than lemon – how creative! Aw thank you 🙂 The colour fair catches the attention nicely (and naturally!) I've only seen one or two alternative meringue flavours such as rhubarb but given that I had a hoard of the foraged berries I thought I'd give it a go. Thank you Sarah 🙂 I was pleased with how well the blackberries worked and even more so given that they were free! Ooh yeah, runny egg yolk, mmm delicious! Phew for gas hobs I say, I personally prefer a gas hob over electric any day – doesn't put your eggs in all one basket (see what I did there 😉 ). Yes, it's lovely to bake and make lovely desserts and cakes but they do have a negative side of not being overly good for the waste line – I've been painting wood work this avo and put my fat a*** against a section I'd just painted! We tend to share most of our bakes with family, work colleagues, neighbours and the likes though so I share those calories out a bit. Thank you Mands re the meringue, go and get some blackberries they're free!! Though don't get bitten by critters like I did!! I'm with your Mum on seriously loving fried eggs in a white bap. Now this meringue is amazing. A real show stopper with the colour contrast. I love it and I know I will be trying. I don't think I could trim my pastry after blind baking either. Thank you so much for popping by and linking up with the Blackberry posts, Angela. I love seeing what seasonal wonders people come up with. She's a genius isn't she; we've not had a fried egg butty for so many years I daren't count them, but as soon as she mentioned them I too just had to have one. It definitely didn't disappoint, so scrummy, and surprisingly filling! Thank you re the meringue, hope you enjoy it Clare. I recall trimming the pastry once many years ago after a full blind bake and the pastry was damaged so it put me off doing it again. It may be because my knife wasn't sharp enough, I don't know. I've even seen pro chefs on TV levelling off their baked pastry with sharp nutmeg type graters which is a thought! It's a cracking colour isn't it. Eggs are brilliant, I was quietly astounded by just how much quality nutrition are in those little things. 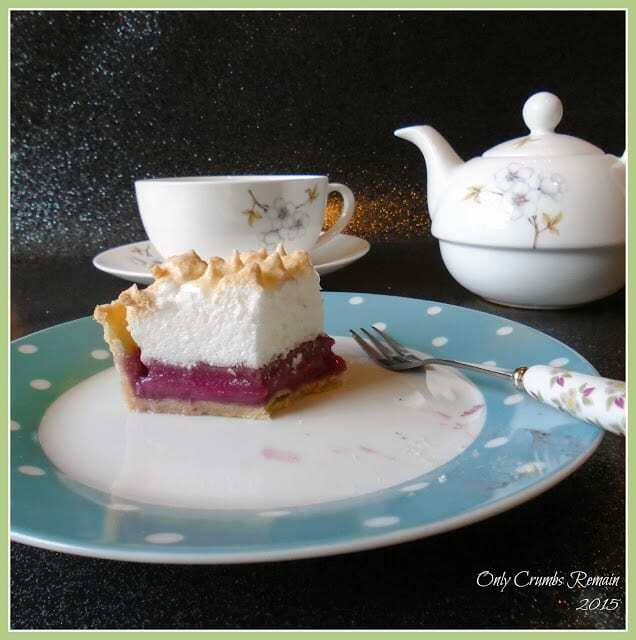 Your blackberry meringue pie is just so gorgeous! 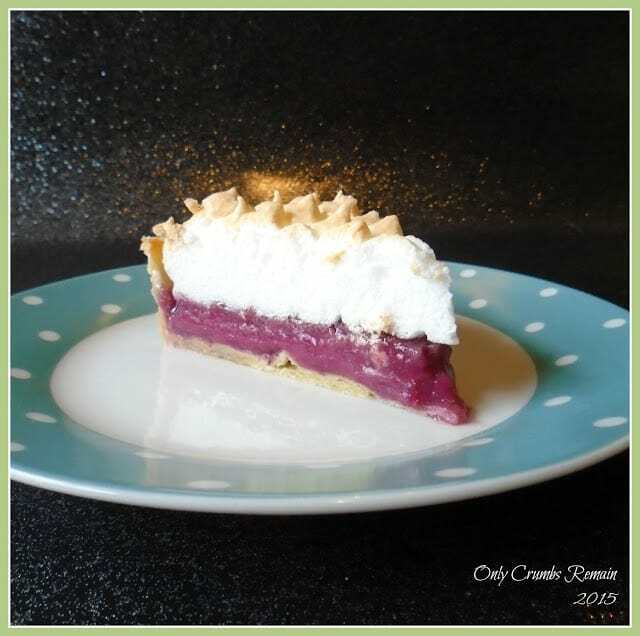 The contrast between the deep purple filling and pearly white meringue is stunning. I can't wait to get some fresh summer blackberries and make this for myself! Also, I'm with your mum, a drippy egg butty sounds delicious! As soon as my mum mentioned the fried egg butty, I had to make one and relive that taste sensation! Delicious! And so easy! Wow! What a great alternative to lemon, especially this time of year, with so many blackberries around. I remember having to do a project at college and were given the topics Bread, Sugar or Eggs, and I chose eggs. I think it's like anything, once you look into these things, you discover a whole lot more than what's on the surface. While I don't remember much (it was over 25 years ago), I remember thinking, "that's why chef's put salt in the water when they cook their eggs." As obvious as it seems now, I didn't realize how porous they were. Totally agree, eggs are just great, they're so nutritious and can be cooked simply or as something a little more involved. I don't tend to use salt much in my cooking, but yes, I'd not really though of that but obvious when you think about how porous thy are. !